Ten days ago I gave the eulogy at my father’s funeral. I’ve made many speeches, but this was one of the hardest. Grief is an unpredictable as a wild dog. Right up until I spoke I had no idea whether or not I could keep grief from savaging me mid-sentence. But I gave the whole thing—I even sang “Cigarettes and whiskey and wild, wild women”—without a wobble, right up until the last three words. 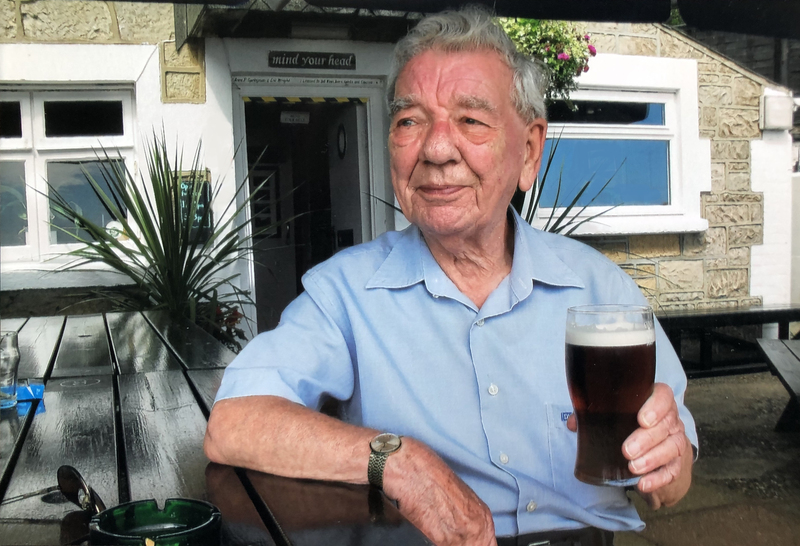 My father in his late 80s, enjoying a pint. I loved my father. He was an honourable man. A man of his word. And very much a man of his time. He was born in 1925. He never owned a computer. He had no use for mobile phones, and I’m not sure he even knew what Uber was. He didn’t much like change. He liked routines: lunch with his sister Dolly, on Monday, at the True Briton—where he ate scampi. Lunch with And and Julie, on Wednesday, at Woodies—where he ate scampi. And lunch with his best friend Derek, on Friday, at whichever pub in town sold the cheapest John Smith’s—as long as they also sold scampi. I think if it had been up to him the world would have frozen in place just after he married Mum in 1951—when women wore their hair long, and skirts, and short-haired men wore suits—but only if he could still eat scampi. In WWII he was a radio operator in the merchant navy. He loved that. I think he visited every continent except Antarctica. He was very proud of his ship, and very proud to become her Third Officer. He loved telling stories of being a sailor… Like the time the allied fleet liberated Norway—for which every officer got a case of whiskey and a German pistol. And maybe they got other favours, too, though we never actually talked about it—except, one autumn afternoon, when he’d had a glass of whisky, he burst into a chorus of ‘Cigarettes and whiskey and wild, wild women…’ (I nearly choked on my beer.) But he gave all that up to marry my mother. In many ways Dad was a traditionalist. He believed in certain hierarchies: by gender, by age, by class. People, in his book, should know their place and behave accordingly. We should never get above ourselves. The one time he broke from that personal rule was his marriage to my mother. Dad was not religious, but my mother was Catholic. To get the Bishop’s permission to marry Mum, Dad had to promise to raise their children, raise us, in the Church. The Bishop was still dubious, but eventually he agreed: However, it was Lent, he said, so there could be no music. But Dad loved my mother, and my mother loved music, so for once he stepped out of his comfort zone and said: My wife will have music. And so Mum and Dad were married, in a full nuptial mass, with music, in Lent—which at the time was unheard of. Still is, actually. But somehow, nearly 70 years ago, Dad charmed the Bishop into bending the rules. Dad could be very charming. Every woman who came away from a conversation with him said, What a lovely man! Part of his charm, of course, was those stories he used to tell of his days at sea: Stories told with wit, verve, and just a hint of wickedness. ‘This scar,’ he’d say, pointing to his chin, ‘is from a fight I got into with a Yank in port. He kicked me under the chin and knocked me cold.’ Or the time, for a bet, he drank an entire bottle of whiskey in one go, and ended up in hospital for two days. That obsessive hatred of waste drove me crazy when I was growing up. I’d be reading in the lounge at dusk and he’d come in and say, ‘Don’t waste electricity,’ and flick the light off. But I’d give anything to have him walk in here, now, and tell me there was nothing wrong with those eggs—those six-month old eggs—in the fridge, or that those brown and shrivelled daffodils were perfectly good for another week. I will miss, especially, the chocolate oranges he sent me, every Christmas, wherever I was living, carefully boxed in old, cut-up birthdays cards, wrapped with reused brown paper, and tied with string saved from 1963. I will miss so very many things. But so much of him is in me—in us, his children, and grandchildren, and great grandchildren, and great great grandchild—like his love of winning: at Scrabble, or draughts, or Beetle. Oh, he found such glee in winning; it was the only time he allowed himself to boast and chortle. Many of us, too, share his joy in a pint, or a glass of whiskey. Though, to be honest, he couldn’t tell Bell’s from 20-year Macallan—and didn’t believe anyone else could, either. And none of us sisters are any good at lying, because Dad never lied. Ever. And if he promised you something, he would do it. My father was a man of his word. An honourable man. And I loved him. Sorry for your loss. Wonderful tribute. Lovely tribute. Sorry for your loss.